Northern Tablelands MP Adam Marshall speaking outside the former Armidale Courthouse earlier this month. 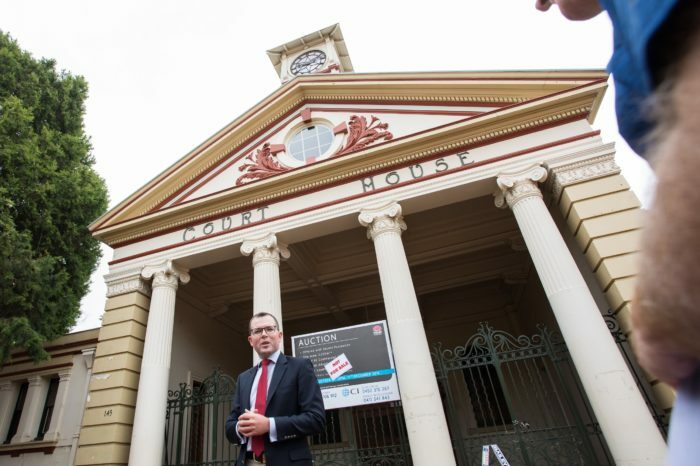 THE 158-year-old former Armidale Courthouse could be placed on the State Heritage Register as early as February next year, Northern Tablelands MP Adam Marshall said today. Mr Marshall provided an update today on his push, on behalf of the community, to have the iconic local building properly recognised and protected with heritage listing. Earlier this month, the local MP intervened to prevent the property going to public auction until the heritage listing application, made by Armidale Regional Council, was determined. Mr Marshall made an urgent request of Heritage Minister Gabrielle Upton to fast-tracking the assessment of the application, so the future use and ownership of the courthouse could be determined. “The Minister has advised me that the application will be considered by the NSW Heritage Council at its first meeting of 2019, in early February,” Mr Marshall said. “If the Heritage Council agrees, it will make a recommendation to the Minister to list the property, which the Minister has given me an assurance she would do as quickly as possible. “This is promising news and I thank Minister Upton for responding so quickly and positively to the local community. “It has always been my strong desire, and that of the community and council, to have the courthouse property retained in public hands. Mr Marshall said he would provide another public update in February.